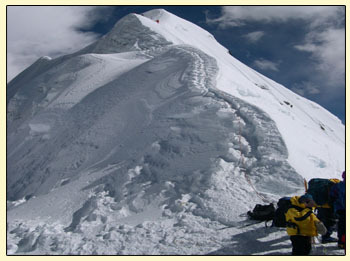 Mera Peak stands 6654 meters high and is considered one of the major, most popular trekking peaks in Nepal. It lies in the Khumbu Himalayan Range. The trail winds amongst forests of pine and rhododendrons in this remote and uninhabited valley leading to the alpine Environment of Mera Base Camp. The Peak itself rises to the south of Everest. The ascent of the peak is technically straightforward, however heavy snow and maze of crevasses can make our journey a longer way to summit. Besides the charm of climbing Mera Peak, the trek to base camp from Lukla is rewarding to experience rare un-spoilt regions of Nepal with densely forested hillsides. Day 01 Arrival in Kathmandu airport (1345meters). Overnight at hotel. Day 02. Pre-trip Meeting and Sightseeing around Kathmandu valley. Overnight at hotel. Day 03 Morning fly to Lukla (2804 meters) trek to Chutok (2800 meters) 3 hours. Overnight at tented camp. Day 04 Trek to Pangkongma (2950 meters) 6 hours. Overnight at tented camp. Day 05 Trek to Kurke (3800meters) 5 hours. Overnight at tented camp. Day 06 Trek to Thuli Kharka (4200meters) 6 hours. Overnight at tented camp. Day 07 Trek to Khothey (3600 meters) 5 hours. Overnight at tented camp. Day 08 Trek to Tangnag (4350meters) 6 hours. Overnight at tented camp. Day 09 Acclimatization and Rest day at Tangnag. Overnight at tented camp. Day 10 Trek to Khare (4900meters) 4 hours. Overnight at tented camp. Day 11 Trek to Mera La (5415meters) and Base Camp (5300m) 5 hours. Overnight at tented camp. Day 12 Climb Base Camp to High Camp (5800meters) 5 hours. Overnight at tented camp. Day 13 Summit to Mera peak (6654meters) and then return to Khare (4900meters) 10 hours. Overnight at tented camp. Day 14 Spare day in case of bad weather. Overnight at tented camp. Day 15 Trek to Khothey(3600 meters). 6 hours. Overnight at tented camp. Day 16 Trek to Thuli Kharka(4200 meters) 6 hours. Overnight at tented camp. Day 17 Trek to Lukla (2804 meters) 7 hours. Overnight at tented camp. Day 18 Morning flight to Kathmandu. Overnight at hotel.